Haryana, is an integral part of Punjab, obviously one can find the touch of Punjabi cuisine in this cuisine. Haryana cuisine is called as Haryanvi cuisine and the food prepared under this cuisine will go for good and pure food, their food goes for simple preparation as much as their civilization. The state of Haryana is named as 'Land of Rotis' coz the natives cant resists themselves from Rotis. Haryanvi foods which goes into the stomach gives a satisfying feeling and obviously any eater can relish this food without any fuss.The most important wealth of Haryana is their milk and milk products. Tea and Buttermilk are the local drinks. Haryana's Thandai is the local delight which is a sweet drink made from milk.Few dishes are very much popular among the Haryanvi natives coz they are prominently agriculteurs,bajra ki khichdi,a whole millet porridge is a famous dish eaten along with ghee. Aloo ki tikki is prepared with mashed potato, stuffed with spicy lentils, this tikki is relished with tamarind chutney is an another famous dish here. Mixed Dal,a dal dish prepared with a mixture of spiced pulses is eaten with ghee are served along with traditional breads include chapattis and pooris.Teet Ka Achar is also famous which is made up of Kair Tree.Since Haryana's wealth is milk and milk products, many of their desserts are prepared with milk and their lists goes for a long. Actually i was searching for a dessert from Haryanvi cuisine, but finally i ended up with a easy breezy pancakes like sweet dosas called Meethe Pude, i picked this quick sweet Haryanvi style pancakes from Mitha's space, seriously this dish is simple to prepare,easy to cook and you will enjoy each and every bite of this delicious meethe pude. Fennel seeds added in this recipe will gives an excellent flavour while having this sweet thick dosas and i loved it. 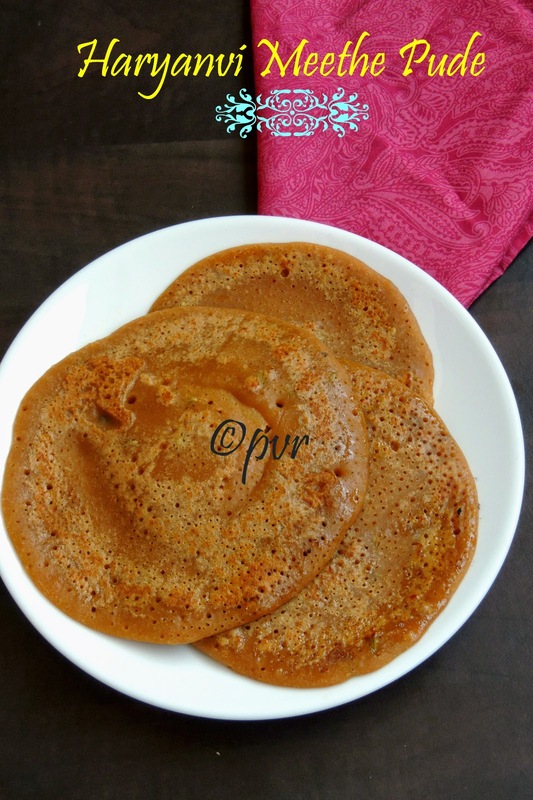 A simple sweet dosas gets ready in a jiffy with simple ingredients.You can serve this sweets pancakes simply with Thandai or else with honey, but my choice is honey definitely.Sending to my own event Healthy Diet-Cooking with Wholegrains guest hosted by Nupur. Melt the jaggery with a cup of water, strain the jaggery syrup and let it cool. Add the wheat flour to the syrup,mix well. Batter will be bit thick, add half cup of water and mix the batter as much as like pancake batter, keep aside for half an hour. Now add the fennel seeds, cardamom powder,mix well. Heat enough ghee or oil in a pan. Pour a ladle of the batter, drizzle oil or ghee and cook in medium flame. Cook on both sides until the pancakes gets well cooked. Serve warm with yogurt or honey. My mom used to prepare this same dish without adding fennel seeds. Its our childhood Favourite dish even now too ;-)I love the caramel taste of the jaggery in this dish. delicious and different recipe !! Wow! vella dosa looks super. We too make it without fennel seeds. Sometimes add scraped coconut to it. Lovely! Yea I read about this when I was searching..very good choice!..and kids might love this.. This is the easiest and the fastest breakfast for my kids,and they love this pude, I use brown sugar and ragi flour! I will try with jaggery. This is new to me, loving it though! These pancakes look very inviting! Such a simple recipe.I am sure the addition of fennel seeds would have added a nice touch to it! Sounds simple and looks delectable...love the new change in blog/header. Happy to follow you. Sweet and yummy,kids will love this. looks super yummy...so good to know about various cuisines in India..thanks for sharing..
Priya thirst pumas make me nostalgic. I read the post yesterday morning..but I could not comment..ah it took me back to school days when we used to have these on rainy days...those were the days..love them. Such a simple dish, jaggery sweetened wheat, wow! The fennel must add a lovely flavor. Healthy & nutritious pude.. They look perfect. Delicious. I too was tempted to try them. They are like our jaggery dosas, right? Priya these look so beautiful. I wish I can get some of these.